This article is about the Philippine island. For other uses, see Mindoro (disambiguation). 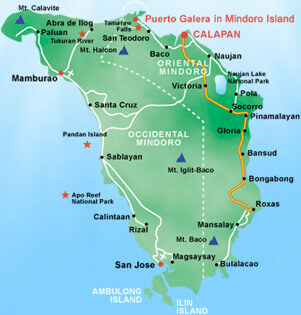 Mindoro (Tagalog pronunciation: [mɪnˈdoɾo]) is the seventh-largest island in the Philippines. It is located off the coast of Luzon, and northeast of Palawan. The southern coast of Mindoro forms the northeastern extremum of the Sulu Sea. 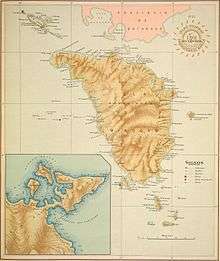 In past times, it has been called Ma-i or Mait by Chinese traders and, by Spaniards, as Mina de Oro (meaning "gold mine or Lots of Gold") from where the island got its current name. According to the late historian William Henry Scott, an entry in the official history of the Sung Dynasty for the year 972 mentions Ma-i as a trading partner of China. Other Chinese records referring to Ma-i or Mindoro appear in the years that follow. The products that Mindoro traders exchanged with the Chinese included "beeswax, cotton, true pearls, tortoise shell, medicinal betelnuts and yu-ta [jute?] cloth" for Chinese porcelain, trade gold, iron pots, lead, copper, colored glass beads and iron needles. The island was the location of the Battle of Mindoro in World War II. The economy of Mindoro is largely based on agriculture. Products consist of a wide variety of fruits, such as citrus, bananas, lanzones, rambutan, and coconuts, such cereals as rice and maize, sugar cane, peanuts, fish (catfish, milkfish, tilapia), livestock, and poultry. Logging and the mining of marble and copper also thrive. Tourism is a lucrative business as well, with locations such as Apo Reef National Park, Lubang Island, Puerto Galera, Sabang Beach, and Mount Halcon. Puerto Galera's beaches are the island's most known tourist attraction and are widely visited. The principal language in Mindoro is Tagalog, although in some parts it has been greatly influenced by the native Visayan and Mangyan languages. Mainstream Filipino and Taglish are, indeed, present in and around such areas as Puerto Galera, Pinamalayan, and Calapan City. Visayan and Mangyan languages, too, are spoken on the island, as are Ilokano and some foreign languages — e.g., English, Fukien, and, to a much lesser extent, Spanish. The common religions on the island fall under Christianity. The religion of the indigenous Mangyan population is animism. Though they are into animism as a religion, the Catholic Church in some of Mindoro's parts is also active. 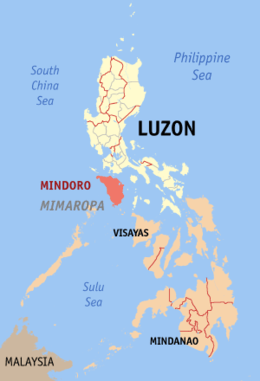 Mindoro is also home to the Tamaraw or Mindoro dwarf buffalo (Bubalus mindorensis), which is endemic to the island. The Tamaraw is a bovine related to the water buffalo and is an endangered species. 1 2 3 "Islands of Philippines". Island Directory. United Nations Environment Programme. Retrieved 22 May 2015. ↑ "Total Population by Province, City, Municipality and Barangay: as of May 1, 2010" (PDF). 2010 Census of Population and Housing. National Statistics Office. Retrieved 22 May 2015. 1 2 Scott, William Henry. (1984). "Societies in Prehispanic Philippines". Prehispanic Source Materials for the Study of Philippine History. Quezon City: New Day Publishers. p. 70. ISBN 971-10-0226-4. ↑ "Republic Act No. 505 - An Act to Create the Provinces of Oriental Mindoro and Occidental Mindoro". Chan Robles Virtual Law Library. 13 June 1950. Retrieved 9 March 2016. Wikisource has the text of The New Student's Reference Work article Mindoro.